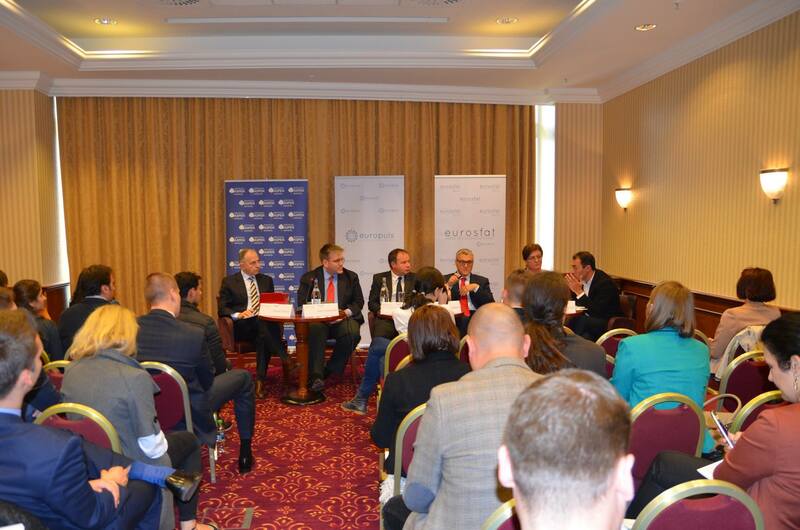 Aspen Institute Romania and Europuls are organizing the debate “The potential of the TTIP: Impact on the Romanian economy and harmonization standards”, during the EUROSFAT conference, to be held in Bucharest on May 6, 2016. EUROSFAT is the largest annual forum on European affairs in the country, taking place in Romania since 2013. The objective of the event is to bring together politicians, central and local authorities, activists, business representatives, researchers, experts and citizens in order to debate on key European agenda policy issues, and to help better shape Romanian positions and views within the European Union. The panel sets to take a look at some of the major regulatory cooperation provisions envisaged in TTIP and the status of the negotiations. Focus is laid on a deeper analysis of benefits the treaty would bring to trade and investment, with an eye to potential costs for European citizens. This conversation is necessary in order to better understand the trade policy priorities of major economic actors from Romania and the region as well as benefits deriving from international trade in terms of firm competitiveness, access to markets and services, job creation and consumer welfare. Talks aim to assess TTIP’s role in fostering a 4.0 type economic model in EU – US relations. This would require a fast – paced revolution in manufacturing processes, most of these involving transformations across modules. These transformations require completely new sets of skills on the labor markets across the EU and the US. This raises a set of important questions: What are the advantages for sectorial non-automated manufacturing industries (e.g. non digital services)? What is the impact of circular economy in the long run? Potential approaches may relate, in the case of skills and manufacturing, to concerns over labor delocalization initiatives. For start-ups and SMEs active in the technology sector, bio-tech and other innovative industries, TTIP is particularly relevant in helping these economic actors access international financing and markets. While gains from TTIP are not equally spread between EU Member States, Romania is expected to benefit from the agreement, as it is mainly a services-oriented economy. 8.9% of Romanian total good exports and 23.2% of its total services exports go to the US. TTIP would help increase Romania’s GDP by 0.2%. Exports to the US are expected to increase by 18% and consumer prices are estimated to go down by 0.1 percent. Furthermore, as 87% of all Romanian exporting companies are SMEs, providing jobs to over 100.000 employees, TTIP chapter on SMEs should help many Romanian companies gain market access in the US. At the same time, while Romanian low-skilled workers’ wages are expected to decrease marginally, the wages of high-skilled workers should grow. Further research estimates that 93% of the economic benefit for Romania from TTIP will come not from tariff cuts but from the dismantling of non-tariff barriers. The panel looks also at the sectors of the Romanian economy which stand to gain most from TTIP, but also at social and economic actors who may be affected by the treaty provisions. The debate will also address issues raised by some civil society organisations related to potential lower European standards.